LL: did any of you listen to today’s sermon? 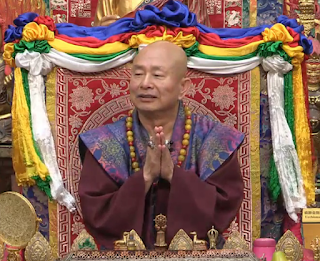 In this speech, GM Lu shared that Adharmabuddha first transmit 恒河大手印法Ganga Mahamudra Dharma to Bao Yi Tong Zi . Thus, Bao Yi Tong Zi, is actually the 2nd generation of transmission of Mahamudra. GM Lu said about 30years ago, he has already written in the 50th or so book about Mahamudra. And Maha Perfection includes Mahamudra, and is the more rounded and perfect dharma. GM also touched on the 4 levels of Yoga. With the final one as “No Cultivation Yoga”. Please go listen to GM carefully and see what you can pick up to help you in cultivation!